XIAN UPRISING TRADING CO., LTD. WAS FOUNDED IN 2001, LOCATED IN XI'AN, A CITY WITH LONG HISTORY. IT IS A PROFESSIONAL TRADING COMPANY MAINLY DEAL IN IMPORT AND EXPORT BUSINESS OF FRUIT AND VEGETABLE JUICE, FRUIT PUREES , FROZEN FRUITS AND VEGETABLES.THANKS TO FIDELITY AND RELIABLITY, THE COMPANY ESTABLISHED GOOD AND LONG TERM COOPERATIVE RELATIONSHIP WITH SUPPLIERS AND BUYERS FROM BOTH DOMESTIC AND ABROAD. AT PRESENT, CUSTOMERS SPREAD IN AMERICA, CANADA, HOLLAND, GERMANY, SPAIN, TURKEY, SOUTH AFRICA, AUSTRALIA, KOREA, TAILAND, SINGAPORE, ETC. 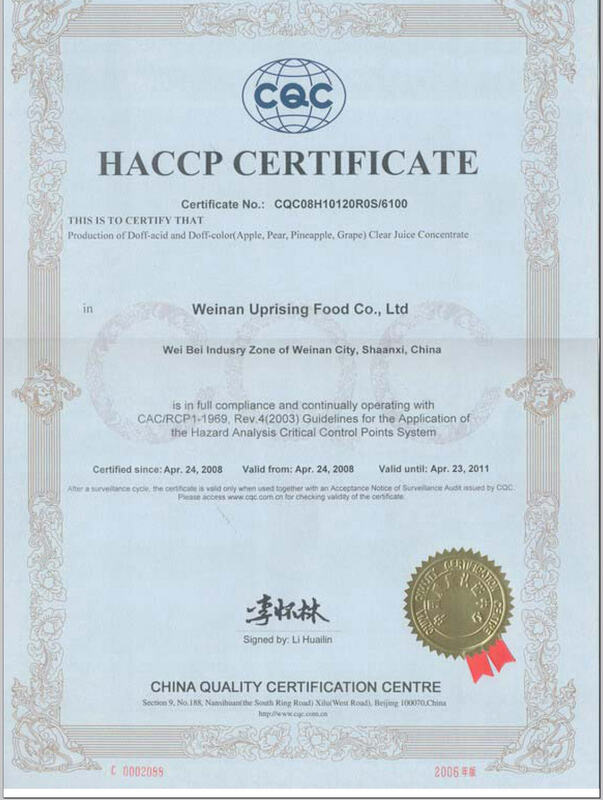 WITH THE BUSINESS DEVELOPMENT AND MARKETS DEMAND, IN 2006, XIAN UPRISING TRADING COMPANY INVESTED AND SET UP IT’S OWN FACILITY – WEINAN UPRISING FOOD CO., LTD. IN WEIBEI INDUSTRIAL ZONE,WEINAN CITY, SHAANXI PROVINCE. THE FACILITY SPECIALIZES IN FRUIT AND VEGETABLE JUICE CONCENTRATE PROCESSING WITH ANNUAL CAPACITY 12000 MT. IT IS ADEPT IN R&D, AND CAN DO R&D AND PROCESS ACCORDING TO CUSTOMERS’ REQUIREMENTS ALL YEAR ROUND. THE MAIN PRODUCTS ARE DECOLOURIZED JUICE CONCENTRATE SERIES, DEIONIZED JUICE CONCENTRATE SERIES AND REDUCED ACID JUICE CONCENTRATE SERIES, ETC. 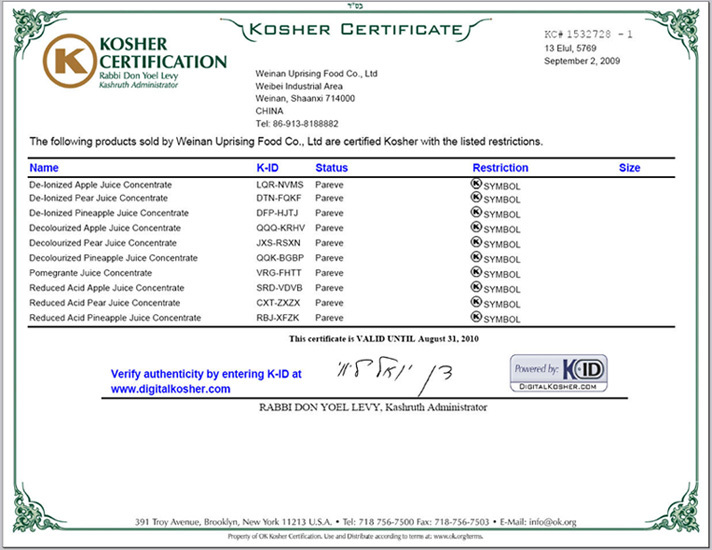 THESE PRODUCTS ARE MAINLY USED IN FRUIT JUICES, DAIRY PRODUCTS, CANNED FOOD, CAKES, CANDY INDUSTRIES, ETC. BY OUR EXPERTISE AND SALES EXPERIENCE, XIAN UPRISING TRADING CO., LTD. CAN SUPPLY CUSTOMERS WITH CONSISTENT, RELIABLE, AND PREMIUM QUALITY PRODUCTS AS WELL AS SERVICE. WE HOPE TO ESTABLISH GOOD COOPERATIVE RELATIONASHIP WITH OUR CUSTOMERS. 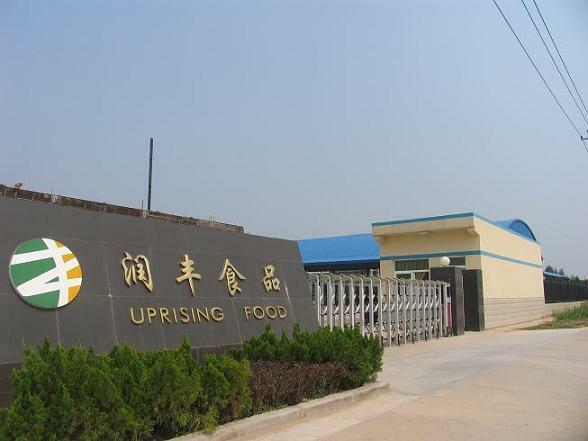 WE HOPE, UNDER THE SUPPORT OF OUR CUSTOMERS AND IN THE EFFORTS OF OUR STAFF, XIAN UPRISING TRADING CO., LTD. CAN BE A RESPONSIBLE AND RELIABLE COMPANY.